Borago officinalis grows to a height of 60–100 cm (2.0–3.3 ft), and is bristly or hairy all over the stems and leaves; the leaves are alternate, simple, and 5–15 cm (2.0–5.9 in) long. The flowers are complete, perfect with five narrow, triangular-pointed petals. Flowers are most often blue, although pink flowers are sometimes observed. White flowered types are also cultivated. The blue flower is genetically dominant over the white flower. 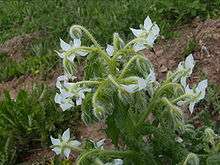 The flowers arise along scorpioid cymes to form large floral displays with multiple flowers blooming simultaneously, suggesting that borage has a high degree of geitonogamy (intra-plant pollination). It has an indeterminate growth habit which may lead to prolific spreading. In temperate climate such as in the UK, its flowering season is relatively long, from June to September. In milder climates, borage will bloom continuously for most of the year. Vegetable use of borage is common in Germany, in the Spanish regions of Aragón and Navarra, in the Greek island of Crete and in the northern Italian region of Liguria. Although often used in soups, one of the better known German borage recipes is the Green Sauce (Grüne Soße) made in Frankfurt. In Italian Liguria, borage is commonly used as a filling of the traditional pasta ravioli and pansoti. It is used to flavour pickled gherkins in Poland. Borage is traditionally used as a garnish in the Pimms Cup cocktail, but is nowadays often replaced by a long sliver of cucumber peel or by mint. It is also one of the key "Botanical" flavourings in Gilpin's Westmorland Extra Dry Gin. The seeds contain 26-38% of borage seed oil, of which 17-28% is gamma-linolenic acid (GLA), the richest known source. The oil also contains the fatty acids palmitic acid (10-11%), stearic acid (3.5-4.5%), oleic acid (16-20%), linoleic acid (35-38%), eicosenoic acid (3.5-5.5%), erucic acid (1.5-3.5%), and nervonic acid (1.5%). The oil is often marketed as "starflower oil" or "borage oil" for use as a GLA supplement, although healthy adults will typically produce ample GLA from dietary linoleic acid. The leaves contain small amounts (2-10 ppm of dried herb) of the liver-toxic Pyrrolizidine alkaloids (PA) intermedine, lycopsamine, amabiline and supinine and the non-toxic saturated PA thesinine. PAs are also present in borage seed oil, but may be removed by processing. The German Federal Institute for Risk Assessment has advised that honey from borage contains PAs, transferred to the honey through pollen collected at borage plants, and advise that commercial honey production could select for raw honey with limited PA content to prevent contamination. Traditionally, Borago officinalis has been used in hyperactive gastrointestinal, respiratory and cardiovascular disorders, such as gastrointestinal (colic, cramps, diarrhea), airways (asthma, bronchitis), cardiovascular, (cardiotonic, antihypertensive and blood purifier), urinary (diuretic and kidney/bladder disorders). Pliny the Elder and Dioscorides say that borage was the "Nepenthe" mentioned in Homer, which caused forgetfullness when mixed with wine. 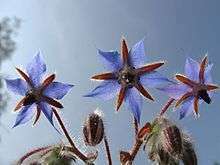 Francis Bacon thought that borage had "an excellent spirit to repress the fuliginous vapour of dusky melancholie." John Gerard's Herball mentions an old verse concerning the plant: "Ego Borago, Gaudia semper ago (I, Borage, bring always courage)". He states that "Those of our time do use the flowers in sallads to exhilerate and make the mind glad. There be also many things made of these used everywhere for the comfort of the heart, for the driving away of sorrow and increasing the joy of the minde. The leaves and floures of Borage put into wine make men and women glad and merry and drive away all sadnesse, dulnesse and melancholy, as Dioscorides and Pliny affirme. Syrup made of the floures of Borage comforteth the heart, purgeth melancholy and quieteth the phrenticke and lunaticke person. The leaves eaten raw ingender good bloud, especially in those that have been lately sicke." Borage is used in companion planting. It is said to protect or nurse legumes, spinach, brassicas, and even strawberries. It is also said to be a good companion plant to tomatoes because it confuses the mother moths of tomato hornworms or manduca looking for a place to lay their eggs. Claims that it improves tomato growth and makes them taste better remain unsubstantiated. 1 2 "Geitonogamy: a mechanism responsible for high selfing rates in borage (Borago officinalis L.) - Springer" (PDF). Springerlink.com. Retrieved 2013-09-13. 1 2 3 "Borage". Encyclopedia of spices. The Epicentre. 2009. Retrieved 2010-12-01. ↑ "Borage Wildflower Finder". Wildflowerfinder.org.uk. Retrieved 2013-09-13. ↑ Dodson, Craig D.; Stermitz, Frank R. (1986). 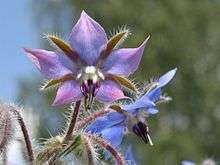 "Pyrrolizidine alkaloids from borage (Borago officinalis) seeds and flowers". Journal of Natural Products. 49 (4): 727–728. doi:10.1021/np50046a045. ↑ Parvais, O.; Vander Stricht, B.; Vanhaelen-Fastre, R.; Vanhaelen, M. (1994). "TLC detection of pyrrolizidine alkaloids in oil extracted from the seeds of Borago officinalis". Journal of Planar Chromatography--Modern TLC. 7 (1): 80–82. ↑ Wretensjoe, Inger; Karlberg, Bo. (2003). "Pyrrolizidine alkaloid content in crude and processed borage oil from different processing stages". Journal of the American Oil Chemists' Society. 80 (10): 963–970. doi:10.1007/s11746-003-0804-z. ↑ Awang V. C. (1999). Eskinazi D., ed. The Information Base for safety assessment of Botanicals. Botanical Medicine. ↑ Langer T.; Franz Ch. (1997). "Pyrrolizidine alkaloids in commercial samples of borage seed oil products by GC-MS". Scientia Pharmaceutica. 65 (4): 321–328. ↑ "Fragen und Antworten zu Pyrrolizidinalkaloiden in Lebensmitteln" (PDF) (in German). Federal Institute for Risk Assessment. 4 August 2014. Retrieved 12 November 2015. ↑ Gilani A.H., Bashir S., Khan A.-u. "Pharmacological basis for the use of Borago officinalis in gastrointestinal, respiratory and cardiovascular disorders", Journal of Ethnopharmacology 114 (3), pp 393–399, 2007. ↑ Gilani A.H. "Focused Conference Group: P16 - Natural products: Past and future? Pharmacological use of borago officinalis", Basic and Clinical Pharmacology and Toxicology. Conference: 16th World Congress of Basic and Clinical Pharmacology. WorldPharma 2010 Copenhagen Denmark. Publication: (var. pagings). 107 (pp 301), 2010. Date of Publication: July 2010. ↑ Al-Khamees W.A., Schwartz M.D., Alrashdi S., Algren A.D., Morgan B.W. (2011). "Status Epilepticus Associated with Borage Oil Ingestion". Journal of Medical Toxicology. 7 (2): 154–157. doi:10.1007/s13181-011-0135-9. PMC 3724443 . PMID 21387119. CS1 maint: Uses authors parameter (link) After taking 1.5 to 3g of borage oil daily for a week; level of GLA in blood was high. 1 2 3 Grieve, Maud (1971). A Modern Herbal: The Medicinal, Culinary, Cosmetic and Economic Properties, Cultivation and Folk-lore of Herbs, Grasses, Fungi, Shrubs, & Trees with All Their Modern Scientific Uses, Volume 1. p. 120. ↑ "Gardening Borage a Companion Plant". Back2theland.com. 2009-05-23. Retrieved 2013-09-13. ↑ Long Island Adventures LLC. "Borage: Herbal Companion". N8ture. Retrieved 2013-09-13. ↑ "Use Borage". Gardenguides.com. Retrieved 2013-09-13. ↑ "GH Organics". GH Organics. Archived from the original on 2013-09-24. Retrieved 2013-09-13. ↑ "Borage Garden Guide". Gardenguides.com. Retrieved 2013-09-13. Wikimedia Commons has media related to Borago officinalis. "Borage". The American Cyclopædia. 1879.